My Great Aunt Bethel, 93, has been quilting by hand since she was a young girl. As she recounted why and how she began quilting, she described how in her day as a young person, "you never mention that you're bored around a farm, because Mother and Daddy would find something for you to do!" So, she asked her mother to teach her to quilt. The problem was her mother was right-handed and Bethel left-handed. So, Aunt Bethel watched and taught herself by mirroring her mother's quilting techniques at their dining table. 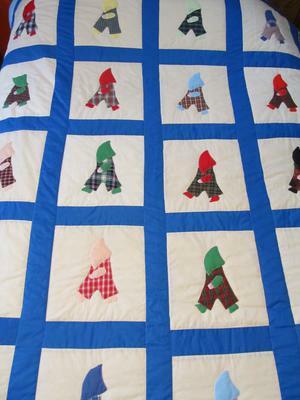 To this day, Aunt Bethel still has a suspended quilting frame in her bedroom where she continues to make lovely hand-sewn quilts; she fashioned this little boy quilt for my son, her great-great nephew, and it will remain a treasure for him and our family from now on.